“Round, round, get around, I get around” the Beach Boys hit from 1964, could well be the theme song for California. Last 4th of July, for example, the equivalent of almost the entire population of New Zealand was expected to be travelling California roads to get to their holiday destinations. Famous for its car culture, the Golden State has always seriously neglected investment in mass transportation systems, whether they be for long-distance or commuter travel. But the world moves on—it’s now possible to fly direct to San Francisco from New Zealand. 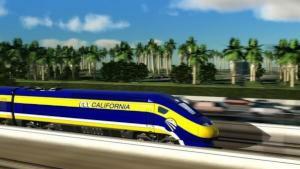 And by the end of this decade, there will be a new rail link between LA and SF. 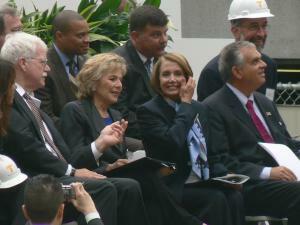 On August 11, ground was symbolically broken to begin construction of a new downtown San Francisco intermodal transport terminal that will accommodate not just local Bay Area transit operators, but also a high speed rail link between the two great metropolises of Southern and Northern California. A rail trip that takes 12 hours today will take 3-and-a-half once high-speed rail is operational in 2020. By comparison, driving that same distance takes five to eight hours, depending on traffic. The same trip is just over an hour by plane. I’ve been interested in High Speed Rail (HSR)since I arrived here, and was part of the slim majority who voted to approve a November 2008 bond measure to begin paying for it. So I trotted along to the sod-turning, which marks the beginning of actual construction, and which was largely made possible by the California High Speed Rail Authority securing the first of what is hoped will be much more federal funding for the project. East Bay Congressman George Miller, Senator Barbara Boxer, House Speaker Nancy Pelosi (whose district is in San Francisco), and Secretary of Transportation Ray LaHood were among the speakers, along with the mayors of San Francisco and Anaheim, and a representative of Governor Schwarzenegger. But the biggest problem is likely to be the time- and money-consuming parochialism of the cities along the HSR corridor. Forty years ago, when the Bay Area Rapid Transit (BART) commuter rail system was being built, its construction was held up for years because some East Bay cities didn’t want the tracks to be above ground. More recently, the construction of the new eastern span of the Bay Bridge was delayed and its cost ballooned when East Bay residents and their municipal representatives insisted that it be not just functional but beautiful and have a bike lane and pedestrian walkway. First mooted in 1989 following the collapse of a section of the roadway on the span during the Loma Prieta earthquake, the bridge is still not finished. 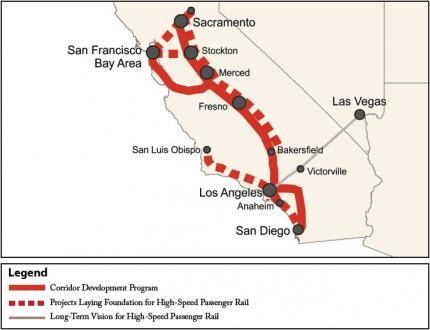 Almost as soon as the CA High Speed Rail Authority was created in the late 90s, a spat broke out about how the link from the system’s Central Valley backbone would gain access to San Francisco, with San Jose lobbying against a proposal for the link branching off at Stockton and coming through the Altamont Pass down the center of the interstate highway into the East Bay then across a new bridge to the San Francisco peninsula. Current plans call for the line to branch off further south, in Merced, and enter the South Bay (and San Jose) instead. As an example of the kinds of challenges the HSRA will face, see this April article about a letter the Palo Alto City Council wrote to them decrying the “incomplete analysis of the rail line’s impacts on Palo Alto businesses, historic landmarks and air quality” contained in the recently re-released Environmental Impact Report. Small wonder then that the newly appointed CEO of the project says in this video on the HSRA website that he needs “partnership and support”. South African born and educated Roelof van Ark has a background as a senior executive of companies such as Siemens and Alstrom, which both make high-speed trains. In the HSRA press release announcing his appointment, van Ark says: “As someone who has devoted his career to this industry, there’s no doubt in my mind that California is the place to be, and I’m honored to be given the opportunity to work with all partners to move California’s high-speed train project forward.” I doubt if anything he has encountered in his previous management of projects in Europe and Asia has prepared him adequately for what he will have to contend with here.